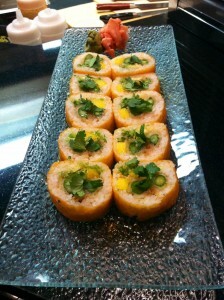 Come in this month and order our new ALS roll, Tropic Thunder! All the proceeds from this roll will go towards the Catfish Hunter Chapter of the ALS Association. Our vegetarian Tropic Thunder roll is made with a paprika soy sheet filled with Panko asparagus, mango, scallions, and avocado topped with our house chili oil, spicy honey drizzle and cilantro.